If you've seen or heard any media whatsoever in the last few months, you'll know that Donald Trump is on a terrifying and meteoric political rise. There's a good chance he could become the President of the United States of America and in the off-chance he keeps his promises, that means he plans to build a wall separating the United States and Mexico. Fortunately, someone has got a head start on building walls. 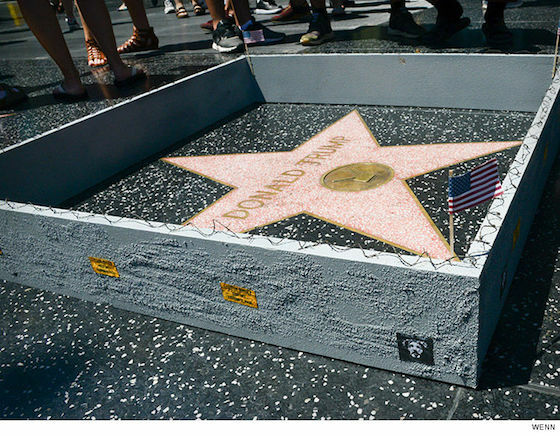 Trump has spent the last few decades as a reality star and pop culture figure, so naturally he's been given a star on the Hollywood Walk of Fame. Recently, someone erected a six-inch wall around his piece of the pavement. The adorably dystopian barrier features miniature barbed wire and an American flag. It's perfect to keep out any microscopic illegal immigrants who might want to encroach on Trump's territory. While no one has officially taken credit for the wall just yet, many people believe it was made by street artist Plastic Jesus. Thanks to TMZ for the tip.